My entrance into motherhood can be compared to a soldier with PTSD re-entering a battlefield, only my battlefield existed inside my home, not a foreign territory. I am a survivor of prolonged childhood abuse and even though I worked extensively on my own recovery before choosing to have children, I was blindsided by the triggers that arose around providing basic acts of care for and with my children. I suffered physically and mentally with no understanding as to why being around and caring for my children made me feel this way. On the outside, I looked like I had it all together. I knew how to go through the motions of being Mom, even a “good” mom, but what I didn’t know was why I continuously wanted to run away from my children, instead of towards them. I was the only one that knew how holding my children, nurturing them, disciplining them, protecting them left me feeling ill and hollow inside. A survivors need to maintain order and control will override her need for self-care because as a child, secrets had to be kept and the appearance of everything being “normal” had to be maintained to keep herself and loved ones safe. That survivor mechanism does not often go away as a survivor transitions into adulthood and parenthood, and the only way to help a person break through that belief is to prepare her for what may happen, so as not to have her triggers be construed as personal faults. I told no one what motherhood was really like for me. I feared being deemed crazy and incapable, and that my children would be taken from me, like I was taken from my parents. The shame that came into play because of that nearly left my children without a mother to raise them. The ah-ha moment that helped shed my feelings of shame, hopelessness and helplessness came as I stood in a room full of women and remembered that 1 in 4 girls are abused before the age of 18. As that statistic popped in my head, so did the realization that we, the survivors, all have one thing in common; we grow up, and most eventually become parents. That simple realization turned my shame into determination, and I was convinced there was no way I was the only one experiencing motherhood like this. I searched relentlessly for parenting books, parenting blogs, anything that would validate what I was experiencing and came up empty handed every time. As a result of that, I and fellow parenting survivor Joyelle Brandt decided to create the resource we both went looking for but were unable to find. The results of that both changed me and saved me. I was and continue to be contacted by mothers and fathers, all survivors of childhood abuse, that identify with the triggers, emotions, challenges, and successes described in our book Parenting with PTSD. As individuals enter parenthood, our culture and professionals “help” prepare the person for nearly every aspect of parenting; however, this occurs under the assumption that parenting milestones and challenges will be similar for everyone. This is not the case for parenting survivors. The ripple effect of childhood trauma seeps into parenthood but is not addressed, leaving the parent unprepared to identify when they are triggered, why they are triggered, or what to do about it when it happens. Doesn’t it make sense that even if a person has learned to manage the effects of childhood abuse, often resulting in post traumatic stress, and live a “functioning” life, that becoming a parent will expose her to triggers she hasn’t yet experienced, possibly initiating a whole new cycle of disproportionate actions and reactions? How can it not? So why aren’t we talking about this with adult survivors, particularly those with a plan to start their own families? Often times as I begin to explain the science behind trauma and how that plays out into parenthood, people will say to me “I never thought about this” or “This wasn’t a part of my training.” The truth is, we can only do better when we know better, and unfortunately parenting as a survivor of childhood abuse is the chapter left out of the plethora of parenting education out there. That’s why despite the challenges in holding these conversations, I continue to run workshops and speak publically about my own story as a parenting survivor with an ACE score of 9. Without including knowledge on parenting with PTSD as part of the preventative work being done to address trauma and break generational cycles of abuse, the goals will continue to fall short. I can without a doubt say that connecting and learning from other parenting survivors, and understanding that PTSD is not restricted to only war veterans has changed my life, and given me the gift of being the mom I want to be, and can be. It’s only now through sharing my own narrative, education on ACEs science, and raising awareness on the most common triggers and reactions of parenting survivors that I have found the courage, strength and know how to breath new life into not only my own diseased family tree, but plant the seed for other survivors to do the same. To learn more about the June 28th Parenting with PTSD workshop visit the HERE this NOW registration page. 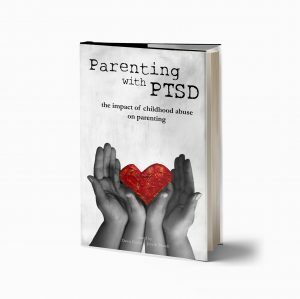 Dawn Daum is co-editor of Parenting with PTSD: the impact of childhood abuse on parenting. Being a survivor of childhood abuse with an ACE score of 9, Dawn is passionate about bringing trauma-informed care to the forefront of family support services, mental health and medical care. Through writing, community action, and public speaking, she is part of an international grassroots movement working to shift our culture’s understanding of what it means to heal from trauma, particularly for parenting survivors. Dawn is the Program Director of Hammond House, a dual diagnosis community residence with Transitional Services Association (TSA) in Saratoga Springs, NY. Dawn is leading TSA’s initiative to implement trauma-informed practices into all services provided by the agency. She is also co-manager of the Becoming Trauma-Informed & Beyond: Resilience in the Workplace community on ACEsConnection.com. When she isn’t capturing life on paper, Dawn is taking advantage of life’s simple pleasures with her husband and two children in upstate NY. You can connect with Dawn on her website: www.parentingwithptsd.com, and LinkedIn.